It’s almost the end of 2017 and it’s the time to look back at the best and worst highlights of the year. Social media platforms are flooded with the top 10’s, best, and worst lists of the year that is now almost over. Amongst those lists was a list of 25 worst passwords of the year that has been compiled by SplashData recently. Yes of course, it caught our eye because it was shocking to see passwords like 123456, password, qwerty and 12345678 in the list. Well we are still not over the fact that, it is almost the end of yet another with tech advancements in our kitty and so many of us are still stuck with such passwords. This list was shortlisted from a list of 5 million passwords hacked in North America and Europe in 2017. Yes indeed with everything going digital, we all have a plethora of passwords to deal with. However, choosing a simple password is actually not the solution. A simple password such as ‘password’ or merely tweaking by replacing o with 0 does not fool the hackers. The fact remains that with evolving technology, the number of cyber crimes are only going to increase each passing day and it is our responsibility to protect our accounts with strong passwords. Experts suggest to use long and unique passwords to protect accounts. Your passwords should ideally contain characters, numbers and punctuations. Some also recommend using phrases or first letter of your favourite sentence or dialogue combined with special characters and numbers. However, to ensure that it is a strong one, it is better to use a random string of letters and characters. Which brings us to, strings of sequential numbers is a bad idea! Infact! strings were the worst passwords, starting from 123456 topping the list to 121212 landing at the 50th position on this list. Shockingly on this list of worst passwords, 3% used 123456 as their password and 10% used a password from the list of top 25. Your account if hacked, can result in you losing important information (personal and professional) and sometimes even financial. Let’s look at some simple to follow steps to create and remember a strong password. While there is no specific rule on the number of characters in a password, however, the longer the password the stronger it is. Your password should have have at least 12 – 14 characters in it. Just a long word for your password won’t do. Your password should be a combination of numbers, alphabets (in both upper case and lower case) and symbols (special characters). The more stronger the combination the harder it becomes to crack. It is advised that passwords should contain a string of words that make no sense. A pattern in your password makes it vulnerable to getting cracked. Uppercase Letters: Use a few capital letters, like, A, E, I, etc. Lowercase Letters: Use small letters like, a, e, i, etc. Let us look at a simple example to make a strong combination. It’s best not to turn to your dictionary or surroundings for the password. That is, the word that we used above, “computer”, should not be made into a password as it is easy to crack. Ideally use a password which has a combination of characters and as such, which doesn’t make any sense. Thus a word like ‘monkey’ (which by the way was on the list as well) is a bad choice. Please skip the names of people, places and your favourites as they are the easiest to crack. Luke likes music and works as a writer! Becomes L1m@w&Aw! Password manager apps are a must have if you tend to forget your passwords. You just need to remember one password and rest of the passwords the app shall take care. These apps also help making a strong password for your various accounts. A password manager secures all your passwords at one place. You just need to remember the password of the manager app to access the other apps. A good password manager app also helps you create strong passwords for your apps. Do not trust any and every password manager apps, we suggest you research well before going in for one! Before we part for this year here are a few more basic yet extremely important precautions that we would like to share with you. Keep all your personal information to yourself. Make sure that you password protect all your important data. Please do not have the same password for different accounts. Never write your password on any digital platform or even paper unless you are using a password manager. Your recovery question should be one, the answer to which only you have. Avoid recovery options like “pets name”. NEVER! Share your password with anyone! Well these were some basic tips from our side to create a secure password. 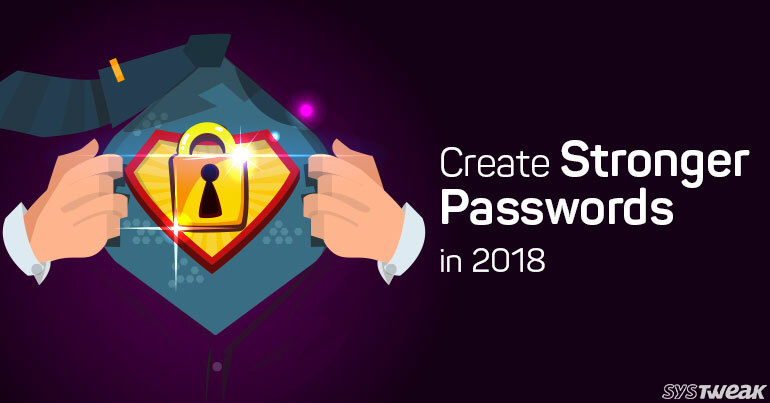 We hope these few tips help you create a strong password that cannot be easily hacked. More to come on password management soon!